A quest to meet a person with a birthday on each day of the year. 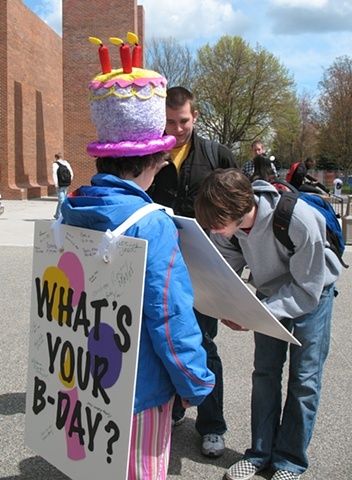 I wore the sandwich boards, birthday cake hat, and coordinating clothes for 5 weeks to acquire first names and birth dates. I visited schools, Fairchild Air Force Base, Spokane's Mayor's Office, theaters, ERs, local bars to help start a discussion about public art, and where it belongs. Each participant was excited to know that their small contribution helped create a large piece of public art.